Blue Heeler spent three months in South Africa from November 2014 to February 2015. These notes are from our experiences and prepared for the benefit of other yachties who may be passing along the same route. Phone numbers, addresses, etc. have generally been left out as many of these do change, but where possible websites are included. View from Blue Heeler looking towards the waterfront complex. Richard’s Bay is the most popular first stop for sailors visiting South Africa. It’s not the most scenic place to be, but it’s easy to enter, close to game parks, you can get repairs done, and has some great inexpensive restaurants! (I hope you like meat…). We stayed there six weeks as we had to have repairs done — Unless you have to get repairs done, I would recommend visiting the game parks as soon as you can, provision up, and then watch the weather for your escape. With end of school year, Christmas and those south-westerly busters, it makes sense to leave as soon as possible otherwise you can get trapped. Personally I would have liked to have spent more time in Simon’s Town and Cape Town than Richard’s Bay. As usual, the weather dictates when boats leave/arrive at various ports so typically there were plenty of boats arriving at Richard’s Bay around the same time as us. We arrived on a Thursday at around 11am, luckily about one hour before a southwesterly blow came through at 40knots! The marina staff at the office is friendly and helpful and between the Port office and Marina staff we asked for Customs and Immigration to attend to us. Immigration turned up on the Friday and their process was straightforward. However Customs did not come to our boat immediately. Despite attempts by us, Customs didn’t turn up until the following Tuesday, but we had stepped away from the boat and missed them. On the Wednesday we took a taxi to their office to clear in where they were most apologetic! There are two marinas – Tuzi Gazi and Zululand. We stayed at the Tuzi Gazi marina as Zululand was full. This turned out okay for us as there were plenty of cheap restaurants and the vibe is pretty good. Can get noisy though on Friday nights outside the Mustang Bar! Friends said that Zululand was good and probably more family friendly. The cost for six weeks was inexpensive and if you’re on a budget, Tuzi Gazi is the place to be. Note: during our stay the docks and fingers were rickety and held together only by the mooring lines of the boats! After our visit news reports were that the docks collapsed so check on the repairs before you arrive at Tuzi Gazi). At the time of our visit AUD$10 was slightly less than ZAR100. Check which banks are your own bank’s preferred provider to save fees, (eg. Westpac Australia is global partner with ABSA Bank thereby you don’t pay the $5 ATM fee when using their ATMs). We were constantly told about ATM fraud in South Africa and although I had trouble with a non-functioning machine which held back R10, this problem does appear to be rife in South Africa. Taxi services are not consolidated but a call to any of them will have you in the Richard’s Bay shopping area for around R60. You can barter for a cheap return from the Boardwalk Mall. For hire car we used First Car Rental (office in Richard’s Bay) then we used Avis (office near the airport). Both require a taxi to get to. The Boardwalk Shopping Mall around 8kms from the marina is the place to go for all your shopping needs – Pick & Pay and Checkers supermarkets have everything you will need. Alternatively there’s a Pick & Pay in Meerensee – about 4kms from the marina. You can walk this, but the locals warned us not to (but we did anyway!). Upon arrival we were directed to a small store at the Tuzi Gazi Waterfront where we were told we could buy a sim card and data. I would recommend you not do this and go directly to one of the major providers, either Cell C, Vodacom or Telcom. A sim card bought at Vodacom cost R5.00 plus around R399 (A$40) for 5Gb of data. (Local guy sold us a Cell C sim card for R50 then after adding R750.00 he gave us only airtime which disappeared in two days – expensive lesson!). We had no trouble with Vodacom and topping up is easy from shops or Vodacom stores. The rudder on our Windpilot Pacific Plus snapped off on the final day of our passage to South Africa so we had to have this repaired before moving on. A fellow by the name of Jan Smit (jan.smit356@gmail.com) has a small workshop at Zululand and we approached him to repair our rudder. It took a while to get quotes, etc., but he managed to repair and replace the old rudder successfully (Note: It worked fine sailing 7000nm to the Caribbean!). For other repairs, parts, etc., you should have no trouble getting these in Richard’s Bay or even Durban, where many suppliers will deliver to Richard’s Bay. If you can wait, you may benefit from getting repairs done in Simon’s Town or Cape Town. Filling up our 9kg gas bottle was no problem from the Norgas Store in Richard’s Bay. You will probably have a hire car at some point in your trip so it’s worth getting it filled here. Cost was around R200 for 9kg (A$20). The Hluhluwe/Imfolozi Game Park game park is the oldest park in South Africa with over 96000 hectares for the animals to roam freely. You can book accommodation at the park by going to the KZN Wildlife website – http://www.kznwildlife.com/. The Park is conveniently located within 90 minutes from Richards Bay and you can buy entry at the gates, but a KZN Rhino Pass is cheaper. These cannot be bought at the park but can be bought from the KZN Wildlife office in nearby Meerensee (next to the Shell Service Station). Cost of the pass was R125 per person (valid for six months). This pass allowed for multiple entries into all parks within the KwaZulu Natal province including the iSimangaliso Park near St Lucia. This park is one hour north of Richards Bay and although not bursting with Big Five animals, you will see buffalo, wildebeest, giraffe and lots of birds. St Lucia has hippopotamus in the river and for around R190 each you can take a two hour boat trip to watch their little ears flicking above the water. If you decide to stay in St Lucia, and there’s plenty of places to stay at (try Agoda.com or booking.com for specials), apparently hippos walk the streets at night. 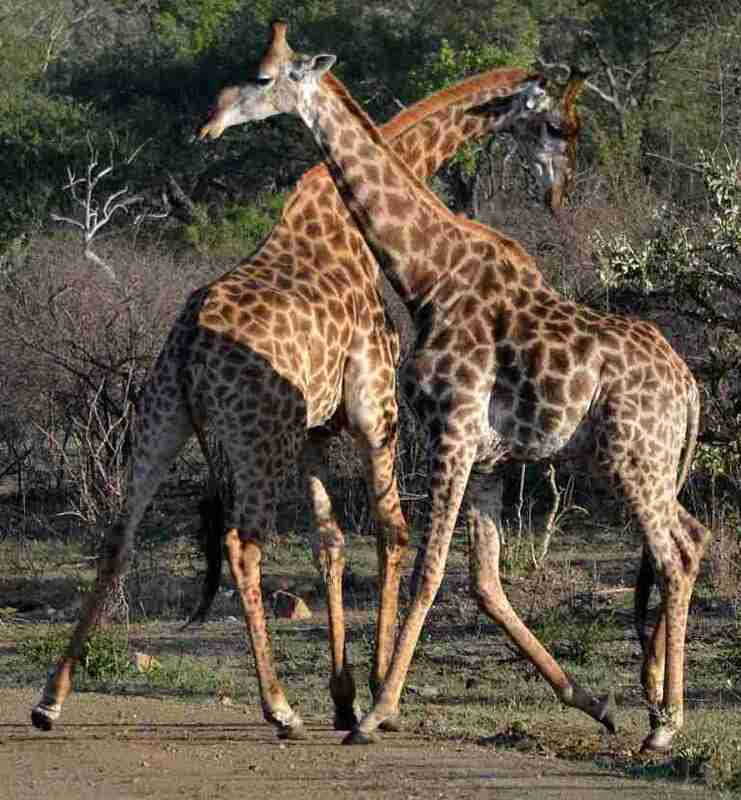 If you’re on a budget, you won’t be disappointed by the Hluhluwe/Imfolozi parks. We saw four of the big five animals – Lion, Rhino, Elephant, Buffalo – but didn’t see a leopard. The park can be seen in 2-3 days, and the iSimangaliso Park can be done in a couple of days. Clearing out of Richard’s Bay requires a ‘Flight Plan’. Basically a few pages that need completing and stamped to confirm you’re ‘good to go’, ie: have paid your outstanding monies to marina. Marina staff will explain the current process, but basically you will need to settle your bill and have them stamp the document, go to Zululand Marina for their stamp, go to Customs then to the SAPS (Police) for their final blessing. It’s a little convoluted and seems unnecessary but until they get a better system, that’s it! We didn’t stop at Durban but drove down by hire car. It’s two hours from Richard’s Bay along the easy N2 highway and the marinas are easy to find. Friends who stayed there were happy enough with the marinas. Some yachts prefer to stop at Durban to break up the trip to East London/Port Elizabeth (as the weather window can be as little as two days). We had a good window and sailed by onto East London. For those planning on going to the USA for longer than 90 days, you may want to consider arranging your US visa here. The process took two working days. Unless you stop at Durban (which we didn’t) your journey from Richard’s Bay to East London will take anywhere from 48+ hours as once you pass Durban you will no doubt be swiftly carried along by the Agulhas Current. We entered the current and were zipping along at 8-10 knots and managed 200nm in 24 hours. Enter the Buffalo River and call port control on channel 12. The Buffalo Yacht Club is very welcoming, with cold beers, showers and potable water. You are supposed to check out with the Police (opposite bank to the YC) then call port to exit the harbour. All is very easy. They charged R50 per night for a mooring plus R1 to use the showers. The town is about 20 minutes walk away over the railway bridge. There is the Hemingsway Mall about 9kms away if you need a shopping fix. Port control can be reached on Channel 12 as you enter. 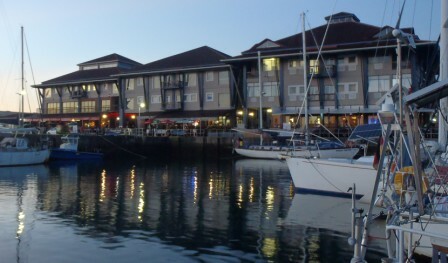 The Algoa Bay Yacht Club has a number of berths with the entrance on the northern side of the marina. We found a suitable berth and pulled in as we weren’t allocated a berth specifically. The staff are friendly; the restaurant upstairs was very busy but the food was good (recommend to book on Friday nights). Yachts at the marina are covered in a black dust – we were there two nights only to allow a blow to pass, and our boat had a film of black dust over it – you’ve been warned! Google Earth view of the narrow and dangerous entrance. Knysna is one of those places that everybody says “You must visit”, but in reality getting in is not that easy! It’s all about timing – the wind, seas and night/day have to be aligned to enter/exit the narrow entrance into this estuary. But once you’re in you’ll be happy you did! The Knysna Yacht Club’s President, Roger, and Administrator Tracey are very welcoming and you’ll be given membership for one week where you can go along to happy hours, dinner at the restaurant or join in on a braai on a Friday night. The Waterfront Complex is not managed by the Yacht Club but by a fellow named Herbie. This is a small, secure marina with immediate access to waterfront shops, restaurants and only five minutes’ walk into the heart of Knysna for all your shopping needs. Cost was R200 per day. Fuel can be arranged at the nearby Caltex – they will come and collect your jerry cans and return them full. Payment with cash or credit card. Gas bottles can be filled – take them across to the Agri store not far from the marina. This store is also good for hardware, kitchen supplies and all that sort of stuff that’s fun to poke around in. There’s bound to be something there you need. The usual car hire places are in town (Avis, Hertz, etc). We hired a small car from Avis and drove around to Mossel Bay, Sedgefield, George and a very narrow, dirt track that took around four hours! On Saturdays is the Sedgefield Market – you won’t find this a market for veggies and such; more for those wanting a latte or feed of something sweet and tasty. To exit Knysna you’ll need to plan your exit from the day you arrive. 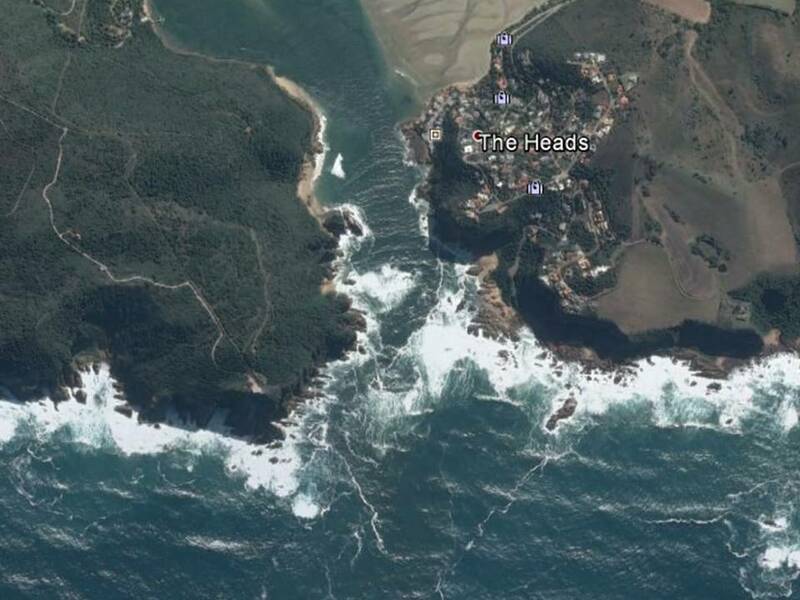 Timing of the tides is a major factor as it took us ten days at Knysna to get the right conditions/timing to leave – even then we had 2.5m swell and 25knots blowing from the south east! Any swell over 2.5m you may as well rethink your exit. Checkout the Knysna Webcam at http://www.theheads.co.za to check out the conditions. At the north west corner of False Bay is Simon’s Town and the False Bay Yacht Club. This is a pleasant place to stop with lovely architecture, train line that takes you into Cape Town and beachside suburbs. The False Bay Yacht Club is friendly and accommodating and has happy hour every night at 5pm. When we were there they had a trivia night on Thursday’s – yachties were invited to join in. There are enough eateries nearby to accommodate and plenty of walking to be had with great views. A visit to the local museum at the Anglican church is worth the visit – learn all about the dog Able Seaman Just Nuisance, and if you feel like a steep walk, you can visit his grave at the hill overlooking the town. Within 20 minutes walk south you can see the African Penguins swimming and sunning themselves. 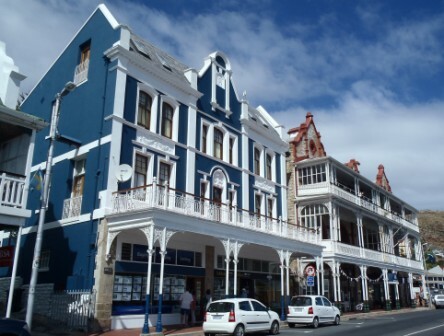 We hired a car from Avis in Cape Town, as there are no car hire companies in Simon’s Town. There are though, some in FishHoek along the train line. A car will give you freedom to get around and help with provisioning. We drove to Table Mountain National Park to visit the Cape of Good Hope (20kms south of the marina); 250kms east driving along the coast you can return to the most southerly point of Africa at Cape Agulhas. A day out at Stellenbosch is also worth the trip. I was disappointed that I didn’t spend enough time in Cape Town. It is an interesting and stunning city with Table Mountain towering above. As a result of our extended time in Richard’s Bay our three month visa was due to expire so we had only a short time in Cape Town. Personally I would recommend staying at least two weeks in Cape Town and two weeks in Simonstown, rather than in Richard’s Bay if you can avoid it. The RCYC is a busy marina and entry to the berths is quite narrow testing the captain’s driving prowess in strong winds. A few times we saw boats hit others as a strong wind blew down Table Mountain causing all sorts of grief down at the docks! The restaurant has nice meals and the beers are cold, but not as inexpensive as Simon’s Town. Contrary to what we were told, the marina is not that far from the centre of town – about 20 minutes walk – but once you have a car or a myCity bus pass, you’ll find it easy to get around. Gas refills and fuel can be arranged from the RCYC chandlery. With a short timeframe, we managed to cram in as much as possible. Places we visited were the District 6 Museum; Bo Kaap township; The Castle of Good Hope; and of course Table Mountain. You may want to take a ferry ride across to Robben Island, where Mandela was incarcerated. Walking through the city area, passing restaurants, markets, etc., is another way to spend a couple of days too. The bus system in Cape Town is very good. We bought a myCity card, topped it up with some Rand and managed to get around the city with no problem, including to Table Mountain. The Woodstock station is a five minute walk from the Royal Cape Yacht Club and the number 103 bus will take you all the way to V&A Waterfront for all your shopping/provisioning needs. Car hire companies are all grouped together in the city and rates were very good. A taxi from the V&A to the RCYC was around R60. Once again you’ll need to fill out forms and have them stamped by the relevant agency. The RCYC will provide you with the necessary forms. Complete paperwork from reception; walk about 30 minutes to Port Control then to Immigration and Customs (same office). RCYC charge an administration fee of R250 for clearance. Why? Because they can! Out of ten? Well let me see… Loved the animals! I’ve always wanted to visit the game parks of Africa and for my first experience I wasn’t disappointed. South Africa is a raw and rugged country. There’s an undeniable and understandable tension between the mixed population – a legacy of its dreadful past. Richard’s Bay, Port Elizabeth and East London show a side of modern South Africa that most tourists wouldn’t see, whereas Knysna, Simonstown and Cape Town display progressive and modern lifestyles, but you have to be blind not to notice the razor wire and spiked metal fences and gates. Having travelled through many countries, we were surprised by the constant warnings by locals and tourist brochures cautioning us to not ‘walk at night’, ‘watch your credit card’, ‘be careful on trains’ and certainly ‘don’t stop at traffic lights or open car windows’ (this one from a tourism brochure). These warnings create a sense of foreboding for visitors and is often a point of discussion between yachties. Not once did we feel threatened, although I suppose given the undeniable racial tension (which is often discussed on local radio, television and newspapers), there’s still a chance of a flare up. Mostly though South African’s were friendly and we had a great time here. (Note: One catamaran on the hard at Zululand Marina was broken into while we were at Tuzi Gazi and all his electronics and passports were stolen, but that can happen anywhere. There were also problems in Johannesburg with looting and harassment of foreign business owners). I was impressed with the vibe in Cape Town and the face of modern South Africa. I would only hope that things get better for the millions that still live in poverty and the tension between races improves for the sake of the future generations. For me, I give South Africa a 7/10 (mostly for the animals! ).